Having moved the engine into the Fabrication Shop, and the tender into Deviation Shed (which now looks more like a North Eastern Shed with the Q6 already there), items 1 - 5 on the project plan have been completed. 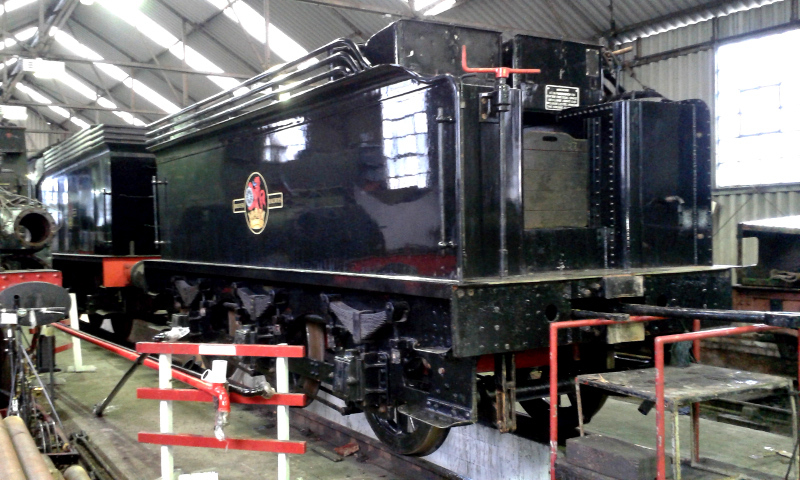 The smokebox has been removed (see photos). 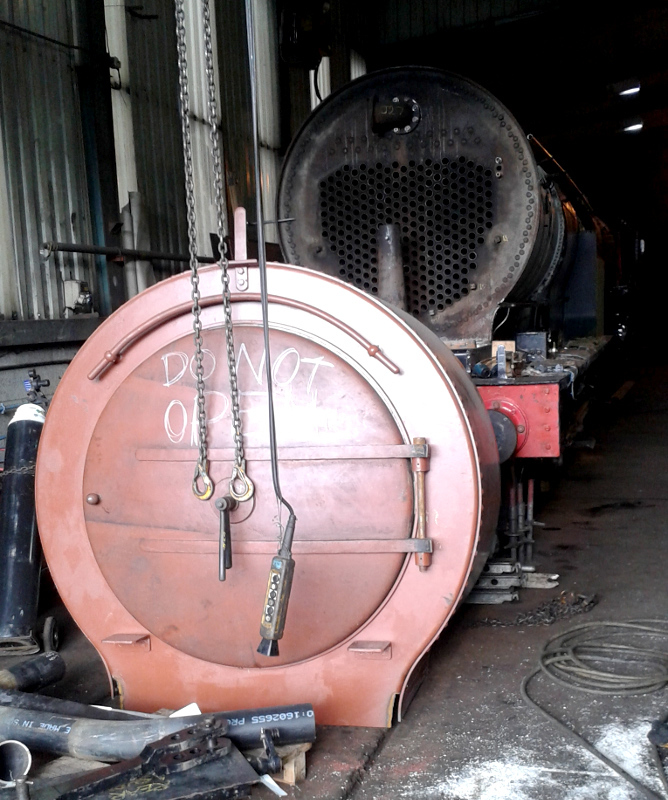 Today was spent by some of the Q6 team in unloading the remaining items from the J27 tender in Deviation Shed, and moving them into the Fabrication Shop where they have been placed on the ground behind the cab. The tender is now empty and ready for filling with water and coal and then weighing (item 26). Those parts that were unloaded by Paul Hutchinson over the weekend and put under the Q6's new small tubes were also moved down to the Fabrication Shop. In addition, Nigel brought down a van load of parts from Hopetown and these were unloaded and put with the other items, except for the cab spectacle plates which have been put in the upstairs store at Deviation Shed, against the wall down by the office desk. Nigel has taken the NYMR van this evening and will be collecting the cladding, the bags of lagging, and possibly the chimney, tomorrow to bring back to Grosmont. That will complete item 6. 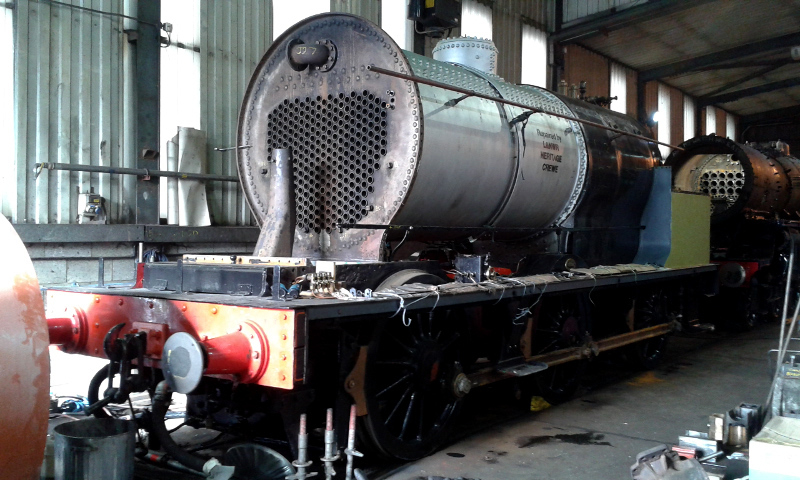 The cab and sandboxes are due to be collected on 3 March and delivered to Grosmont which will complete item 7. 5 rocking grate bars are due to be delivered to Grosmont in the next few days. One of these is for the B1 and the other 4 are for the J27. The J27’s side bearers are already fitted and 4 rocking grate bars (one of which has the crank removed so that it forms a fixed section at the back of the grate) were brought in the tender and are now with the engine– the rest of the grate was scrap. The hydraulic has been arranged for 1 March (item 13).